Location of Meeker in Rio Blanco County, Colorado. Meeker is the Statutory Town that is the county seat and the most populous municipality of Rio Blanco County, Colorado, United States. The town population was 2475 at the 2010 United States Census. 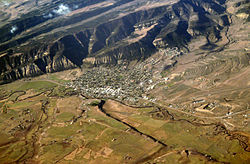 The town is largely an agricultural community, located in the wide fertile valley of the White River in northwestern Colorado. Relatively isolated from other communities, it sits near the intersection of State Highway 13 and State Highway 64, on the north side of the White River and at the base of a long ridge, known locally as China Wall. The Bureau of Land Management has a regional office in the town. Meeker is the home of the annual Meeker Classic Sheepdog trials. The town is named for Nathan Meeker, the United States Indian Agent who was killed along with 11 other U.S. citizens by White River Ute Indians in the 1879 Meeker Massacre. The site of the massacre, the former White River Indian Agency, is located along State Highway 64 in the White River valley west of town and is marked by a prominent sign. None of the buildings remain. After the massacre and the ensuing conflict known as the Ute War, in 1880 the US Congress passed legislation requiring the Ute population to relocate to reservations in Utah. The United States Army established a garrison on the current site of the town, called the Camp at White River. The town was founded in 1883 following the removal of the troops. The White River Museum is located just north of the Rio Blanco County Courthouse and housed in several original wooden structures of the Army garrison. The town emerged as a regional center for hunting by the turn of the 20th century. Theodore Roosevelt once visited the town on a mountain lion hunting trip and stayed in the historic Hotel Meeker opposite the courthouse. The town is also a favorite summer destination and permanent residence for many prominent Americans, including billionaire Henry Kravis, former President and COO of Goldman Sachs Jon Winkelried, and comedian Daniel Tosh. Meeker is located at 40°2′22″N 107°54′39″W﻿ / ﻿40.03944°N 107.91083°W﻿ / 40.03944; -107.91083 (40.039539, -107.910709). According to the United States Census Bureau, the town has a total area of 2.9 square miles (7.5 km2), all of it land. In the town, the population was spread out with 26.8% under the age of 18, 6.6% from 18 to 24, 25.4% from 25 to 44, 26.7% from 45 to 64, and 14.5% who were 65 years of age or older. The median age was 39 years. For every 100 females, there were 94.4 males. For every 100 females age 18 and over, there were 92.2 males. These numbers do not include the residents of the unincorporated area surrounding the town. The average income for households in the unincorporated areas surrounding Meeker was $83,501. The median income for a household in the town was $34,479, and the median income for a family was $43,529. Males had a median income of $36,026 versus $18,242 for females. The per capita income for the town was $17,647. About 9.0% of families and 11.4% of the population were below the poverty line, including 15.9% of those under age 18 and 15.6% of those age 65 or over. ^ a b "Active Colorado Municipalities". State of Colorado, Department of Local Affairs. Archived from the original on November 23, 2010. Retrieved 2007-09-01. ^ "Board of Trustees". Town of Meeker Colorado Government Website, Meeker Colorado. Archived from the original on 2012-01-10. Retrieved 2011-12-29. ^ Dawson, John Frank. Place names in Colorado: why 700 communities were so named, 150 of Spanish or Indian origin. Denver, CO: The J. Frank Dawson Publishing Co. p. 34. Wikimedia Commons has media related to Meeker, Colorado.